Bored by the djembe-hype? 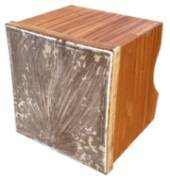 Get ready for something different: There are many African drums that hardly anyone knows of outside Africa! I wonder why we've ignored these traditional tribal drums for so long. They are just as wicked and as African as the djembe drum. Will you be the one to start a new trend? Here's all the info you need to find your new favorite African percussion instrument! In my opinion the most beautiful of all African drums! Its gorgeous design and mystic, mellow sound are just captivating. When hearing kpanlogo drumming in the distance you think you're in the jungle. Want to play yourself? It's doable - and challenging enough to keep you working for quite some time! We often make the mistake to assume that African drums are pure hand drums. In fact, most of them are also played with sticks. The result is a powerful sound! The long master drum called atsimevu is the father of the Ewe drum family. Together, they send a thunder through the forests that you can hear even miles away. Ewe drumming is definitely one of the coolest drumming styles I've heard so far! Just take a look at Agbadza, probably the most famous of all Ewe rhythms and dances. is impressive in size and sound. As a court drum, it is only to be played for kings and chiefs. The majestic drum serves that royal purpose very well! A bit smaller, but just as interesting are the bougarabou, ashiko, ngoma, sabar, tabla, kutiro, atumpan and the brekete. Dundun, lunna, donno, dondo, tama, gangan etc. I can't wait to find out what they are talking about! 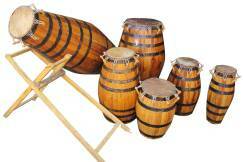 Frame drums like the tamalin from Ghana or the sikko from Guinea are pretty common. The sound of these clay pots are just as mystical as their traditions. The Igbo women in Nigeria are the inventors of the udu drums. The Malinke and Sosso people got creative with calabashes: They filled the yedoundoun and fedoundoun with water. Refreshingly different! Slit drums might be the first drums that human beings ever produced. They can be found all over the world. Guineans call them krin or kolokolos, while the Congolese know them as mukoku.